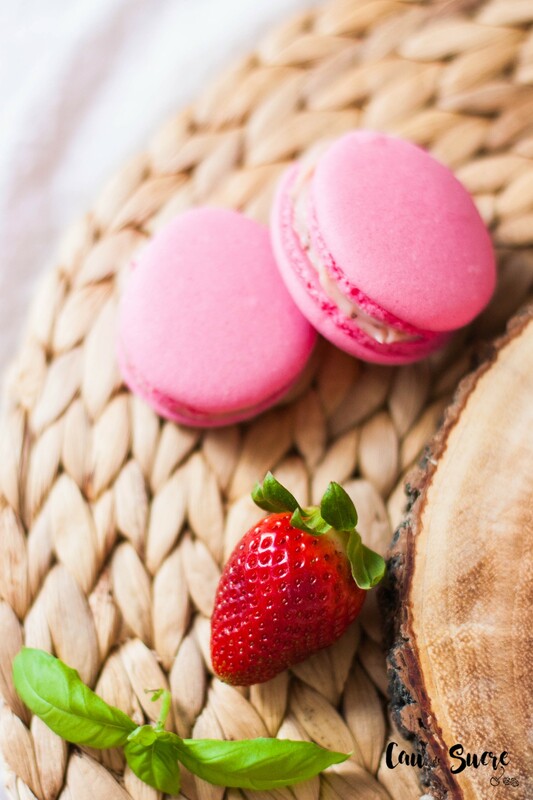 Macarons can be stuffed with anything you can imagine, literally, you will find them in a variety of incredible flavors. 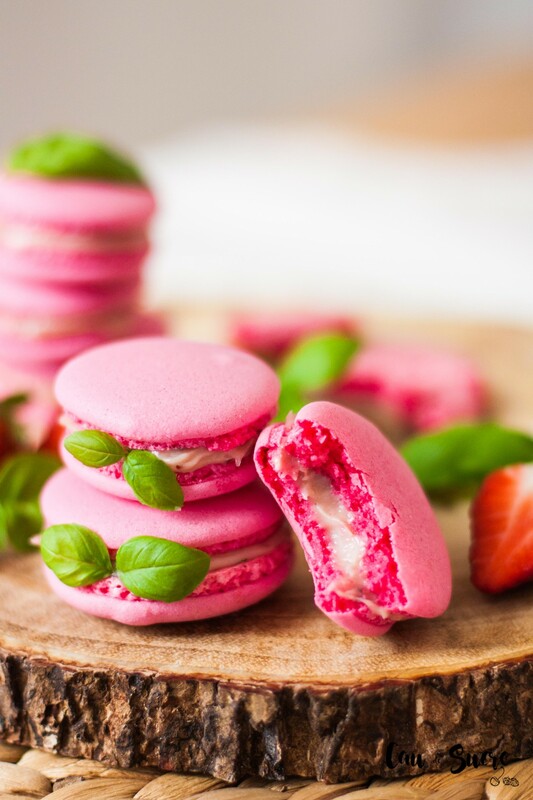 Although I can bet you’ve never seen them with strawberry and basil. 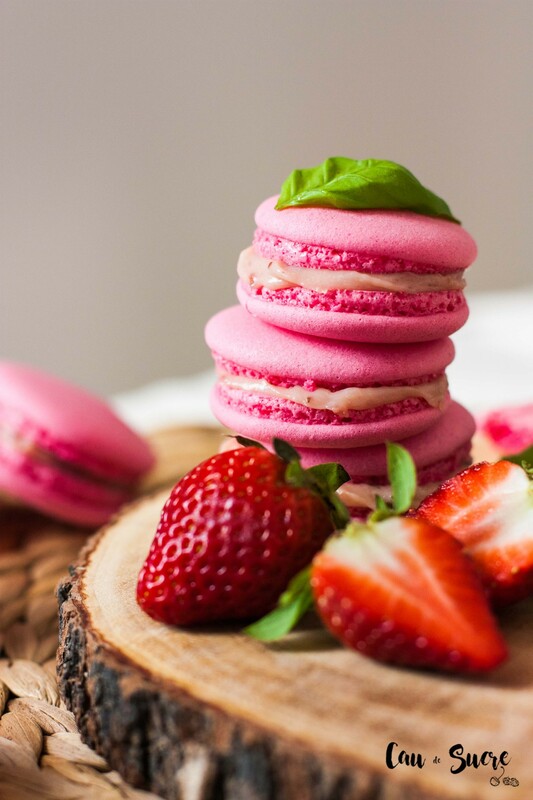 Well I assure you that it is a super good filling with white chocolate, mashed strawberries and a bit of cream infused with fresh basil leaves. 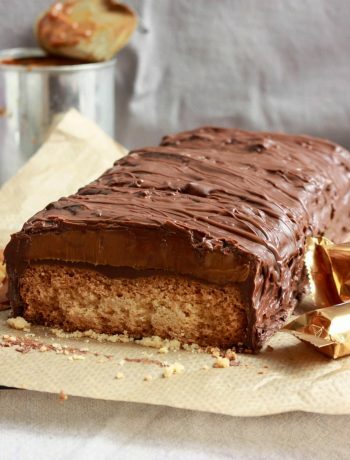 Such a divine bite 🙂 Did I made your mouth watering already? Don’t you think that these were a resounding success, the first tray that I baked also went to the trush. But in the second I decided to experience something different because I already thought of them as lost. And that’s where I think I figured out where the problem was. We’ll have to see if it’s true the next time I try. You will be wondering what I have done so that the second bake goes well, well lower the temperature of the oven wheel at 120ºC. Almost all recipes recommend baking at 140º-145ºC. Well, I do that and they always break on the top, so in desperation I thought the oven was maybe too hot and I decided to lower the wheel to 120ºC. As I have no oven thermometer (soon will get one …) so I can not see what the actual temperature inside the oven is, but I suspect that my oven, being a convection one, heats more than standard ovens and here may be the problem. And another thing I’ve done this time is to let them dry for 1h and quarter. In the recipes they give you a 30 minute orientation time but here in Munich I need a lot more, so you know, always leave them until you touch them and they are dry, no matter how long it takes to wait. Sieve the icing sugar and almond flour with a very fine strainer. Sieve as many times as necessary to make the flour fits well, especially the almond, it is very important that there are no large pieces of almond. Whisk the egg whites with the lemon juice drop and the salt at medium speed until they start to froth. Then, increase the speed to medium-high and add the 30g of sugar. Keep whipping until forming hard peaks. 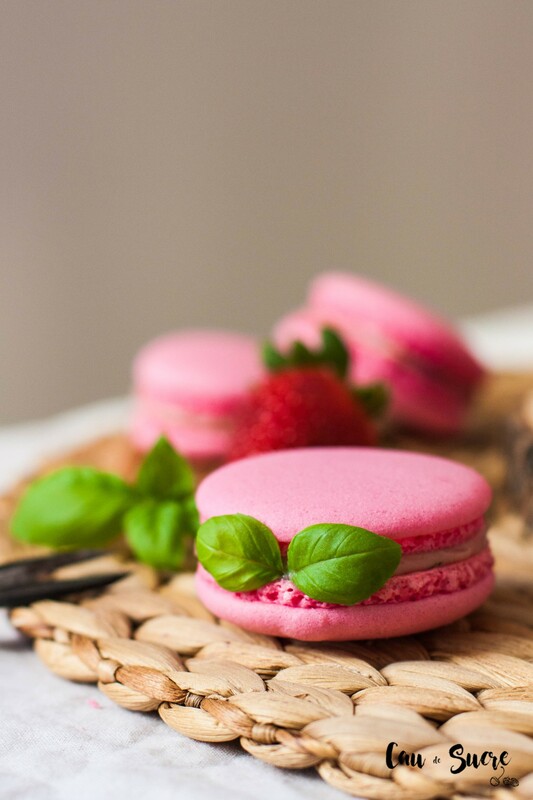 Incorporate the mixture of icing sugar and almond to the meringue and the drop of pink colouring. Mix in wraparound movements (bottom to top) with a spatula and very gently until it is incorporated. Do not mix too much or it will be very liquid, a trick is to count up to 20 moves at most not to overmix. Prepare two baking trays with baking paper or macaron stencils if you have one. 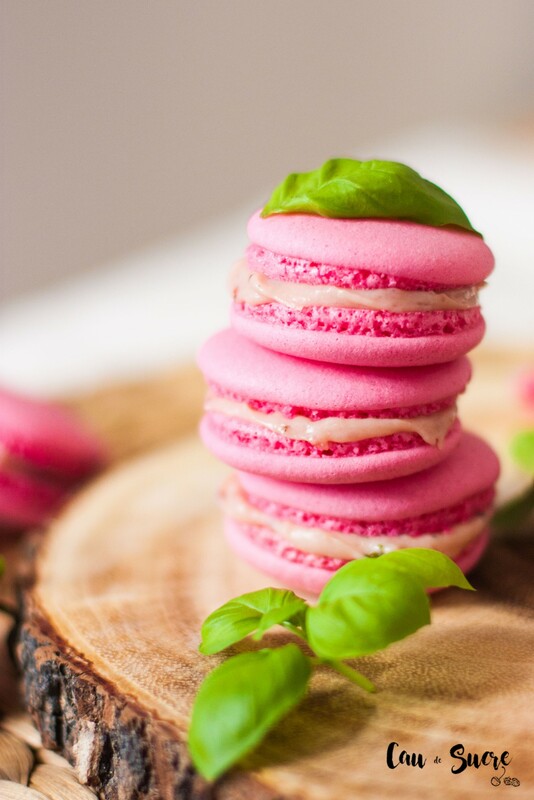 Fill a piping bag with a round nozzle with the macarons dough and create circles of about 3cm in diameter on the trays. Count about 30 per tray. If you have peaks in the top of the shells, wet a finger with water and touch all carefully so that they flatten. 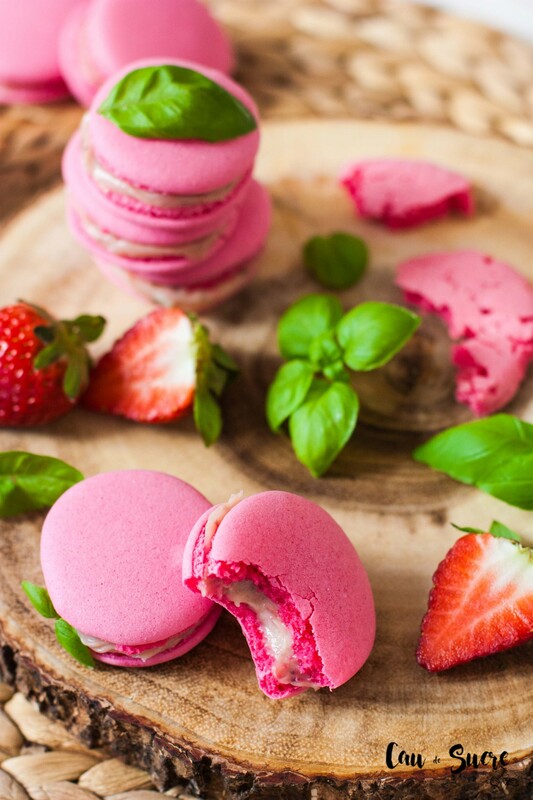 Let the macarons shells dry on the trays until you touch the surface with a finger do not stain. The drying time goes from 30 minutes to 1h and a half, depending on the weather and the temperature of your house. Preheat the oven to 140ºC, bake the shells for about 12 minutes. Remove from the oven and allow to cool completely, do not try to take them off until they are completely cool or they will break. To prepare the filling, mash the strawberries with the icing sugar and the drop of lemon juice until you have a fine puree. Reserve..
Chop the chocolate into a bowl. Heat the cream with the chopped basil leaves in a saucepan. When it boils, remove from heat and pour directly on the chocolate using a strainer so that the leaves of basil do not pass. Let to rest 1 minute and then mix until all the chocolate is melted. Add the strawberry puree to the chocolate mixture by mixing until you have a smooth cream. Refrigerate the cream for at least 1 hour in the refrigerator until it hardens. Stuff the macarons with the cream. 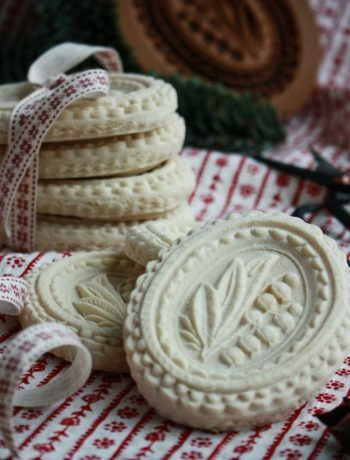 Leave them in the refrigerator for 24 hours so that they have the perfect texture and are softer inside. By the way, I did not tell you above but my first successful macarons have been approved by 4 different French who have tried them. Yeah!!!! I just tried making these. The shells came out wonderfully, but the filling came out way too runny. Any guesses as to why? I really like the idea of these flavors together, I really want it to work out! Sorry Erin, I gave you a wrong answer I thought you posted that comment on another recipe. Did you chill the cream before using it? that step is important to harden it a bit. If yes, my only guess will be the quality of the white chocolate. 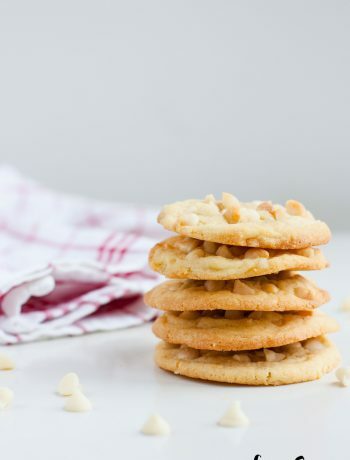 Different brands of white chocolate behave much different when melting it, and it can gets sometimes too runny. For the next time you can also try reducing the quantity of strawberries, but it will lose a bit of taste.